One Legend, Seven Decades. The King of Comics. Graphic Literature in the United States. It’s a truly massive undertaking to put into an article. Even choosing only a handful of creators is a difficult task. That is unless you’ve done massive amounts of research and repeatedly come up with one name. A name that needed no research if you are a true comic book fan. A man that created the Marvel style and imitators galore. I won’t waste time. I had this written with well over a thousand words. But let me condense it. Jack “King” Kirby (1917-1994), “King” chosen not by him, worked in comics beginning in the 1930s. His first superhero work, known of was in 1940 on Blue Beetle. All work on the comic strip was done under one name, regardless of who worked on it. Then he moved to Timely Comics, an ancestor of Marvel Comics and created one of the most popular superheroes, comic book characters in history, Captain America along side Joe Simon. 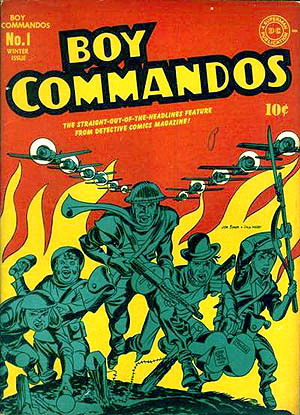 He and Simon, now a team, moved on to DC Comics and created Boy Commandos and worked on Captain Marvel the most popular hero of the decade before leaving for WWII and almost having his legs amputated due to frostbite. 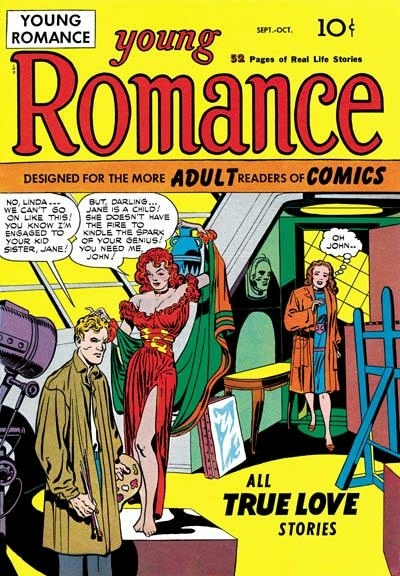 Upon his return he created the Romance genre of Comic books with Simon, titles such as Young Romance and Young Love during what would be called the Atomic Age of comics, that time between the Golden Age starting with Superman and the Silver Age beginning with The Flash in Showcase #4 for DC Comics. 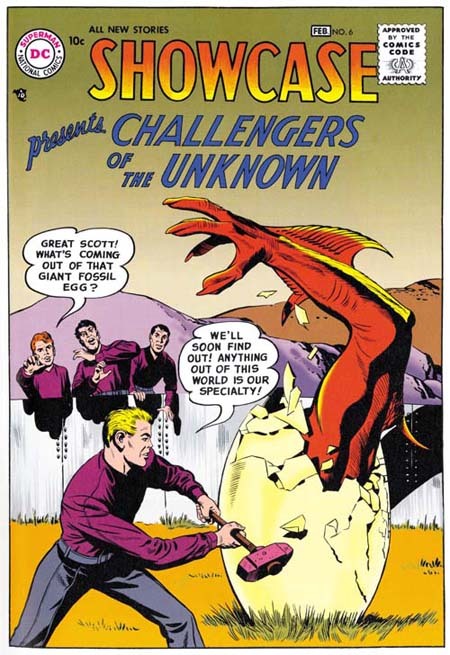 Kirby was there too, creating in Showcase #6 the Challengers of the Unknown. 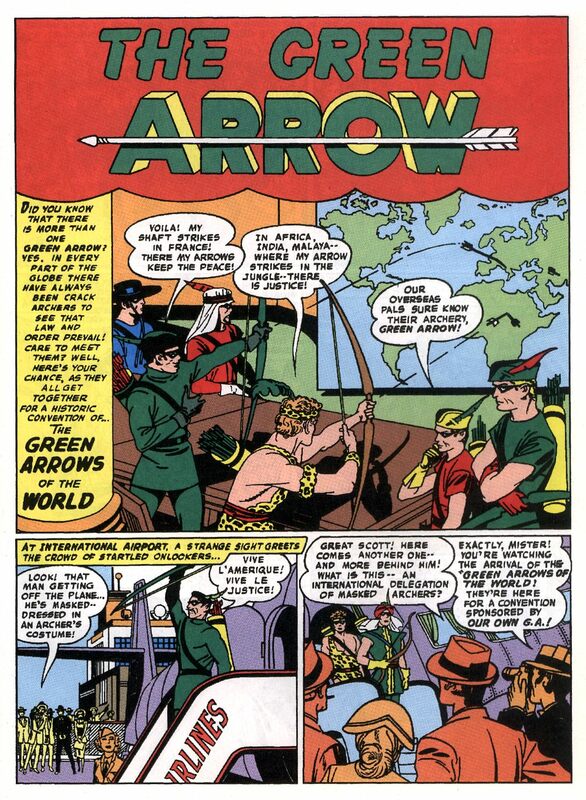 But perhaps what others might find interesting is his work in World’s Finest and Adventure Comics with Green Arrow. His art style was second to none. As was his story telling. He saved a company called Atlas, once known as Timely and next to be known as Marvel. During the late 50s he drew comic after comic across genres and doing these monstrous figures people could not get enough of. Then the explosion happened. November of 1961 sees Fantastic Four #1 hit the stands and comics and Marvel Comics would never be the same. X-Men, Hulk, Silver Surfer, Iron Man, and more characters than I’ll even try to show here. All drawn by Kirby, and in many cases created by him. Here is an inside page of Fantastic Four #1 as opposed the the cover shot many are familiar with. The Marvel method of writing a book went like this, Stan Lee, editor and head writer would go to an artist and say something like, “I want to do the next issue with this happening.” The artist would draw what he liked to match the idea and Stan Lee would put words to it. That’s right, no script. With Kirby it went like this, here’s the pictures and Stan Lee would have to figure out what it was. Yes, Kirby basically did what he wanted, telling the story through his art, and Stan Lee would then look at the art for the first time and come up with the story. You don’t always need words with Kirby books. Something interesting I stumbled across. Stan Lee and Steve Ditko are given credit as the creators of Spider-Man. 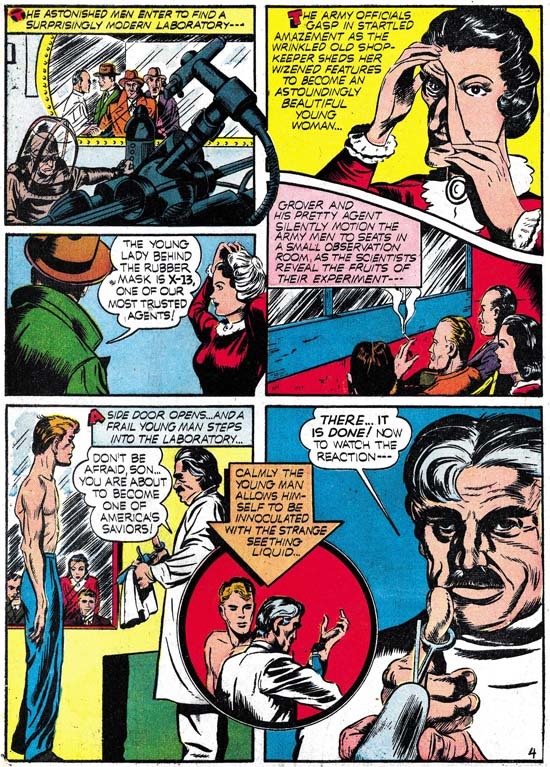 However in an interview by Kirby and in essays by Ditko, both state much of Spider-Man’s story, his basic DNA of character and idea was Kirby. The death of the uncle, the revenge, the web, although Kirby had it coming out of a gun, science, and more. Another sad thing is, a long time assistant spoke about how he drove Kirby and his wife to a store, and the m an asked Kirby if he wanted to go in a Toys ‘r us and Kirby became pale and almost sick and said he couldn’t go in there. Later the wife explained how Kirby couldn’t go in because of all the Captain America toys in there that Kirby should have been getting royalties for made him ill and depressed. Of course Kirby didn’t stay at Marvel forever, he went to DC once again for various reasons. The year was 1970 and Kirby’s move along with several other events that year in comics led to what is called the Bronze Age of Comics. Kirby was allowed to create his own universe, his own world, The Fourth World, which included New Gods, Mister Miracle and The Forever People. Perhaps the most famous character from this world is Darkseid. If you kind of see Thanos from Marvel Comics, maybe even at the end of the first Avengers movie in this image, it’s no mistake. 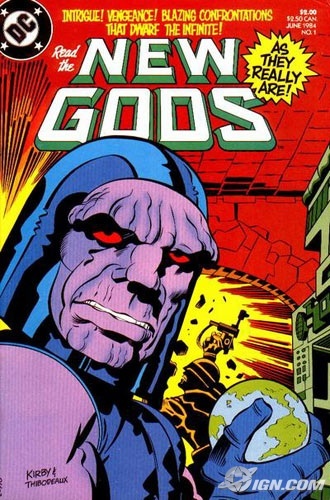 Thanos was based on not Darkseid at first, but another New God, but once showing his creation to Marvel, Roy Thomas was told that if he was going to base a character on a New God, pick the good one, as in the powerful bad guy one. That’s my paraphrasing of the conversation. As with every company he worked for, problems began and he moved on, and back to Marvel and Stan Lee. 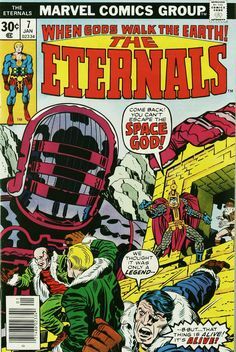 The Eternals and Celestials are perhaps his best creations from this time. But of course he moved on from Marvel. 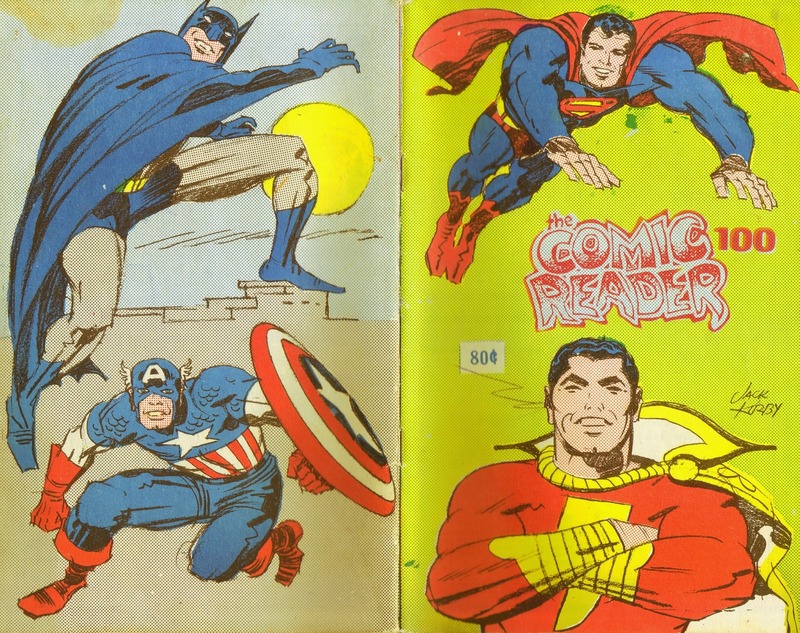 The Modern Age of Comics is roughly seen as beginning around 1985-1987. Watchmen by Alan Moore, Batman: The Dark Knight Returns by Frank Miller, basically darker stuff, and creator recognition began. What else happened? 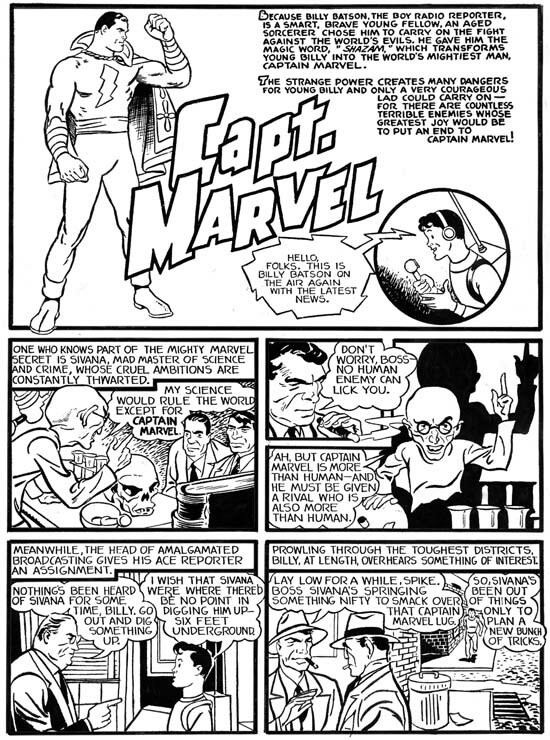 Marvel gave back to Jack Kirby around 1,900 pages of the artwork he had done for them. Kirby had wanted to sell the artwork to be able to leave his family something upon his passing. Creator recognition, finally. I think there is another age of comics. Modern Age might end up having it’s name changed at some point, but for now we will leave it. Perhaps I’ll call the age following it for simple reference purposes the Image Age. This would make the Image Age beginning in 1992 and it would be the age of true creator control and a new wave of storytelling by award winning novelists. And who was there at the beginning? 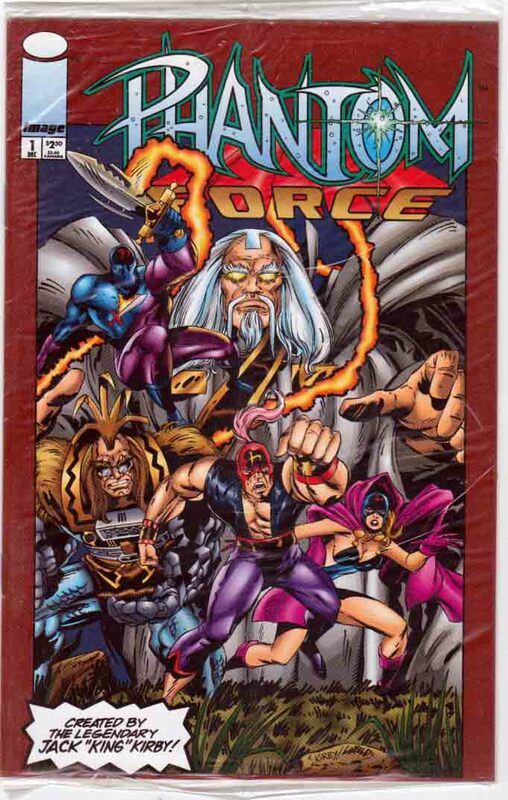 Jack Kirby and Phantom Force, released through Image Comics. In his last years, right before his passing he was able to see his final work printed for a new age and the first issue sell 250,000 copies. What other person can span through every Age of superheroes? Perhaps one man might could stand beside him for that honor, but not for these kinds of accomplishments. It’s not Stan Lee. Honestly, if you like Stan Lee, don’t research too much into comic book history. No one takes away from his way of telling a story and his salesmanship. But there are some things that just don’t make him look good at times. You have to wonder why creative giants like Simon and Kirby left Timely after creating Captain America and the nephew of the publisher at the age of 19 became the editor and art director. Who told Goodman, the publisher Simon and Kirby were working on DC projects? I’ll leave you with couple of stories. Will Eisner was once Kirby’s boss back in the late 1930s, maybe 1939. He tells a story, this is my paraphrasing. Kirby was a small guy, about 5 foot and a bit of nothing. Back then there was a service for the Eisner & Iger offices who would bring in towels and soap. Well someone didn’t like the soap and wanted to change companies. The problem was the company they had was run by the mob, in New York, and they had the whole building. The office got a visit from the stereotype guy, black shirt, white tie and about six foot four. He comes in and threatens Eisner and out comes little Jack Kirby asking if the guy was giving him a problem. The big guy back down slightly until Eisner told Kirby to calm down. They kept the soap and towels. But that’s how Kirby was. Growing up on the Lower East Side of Manhattan, you grew up tough. Showed no fear. 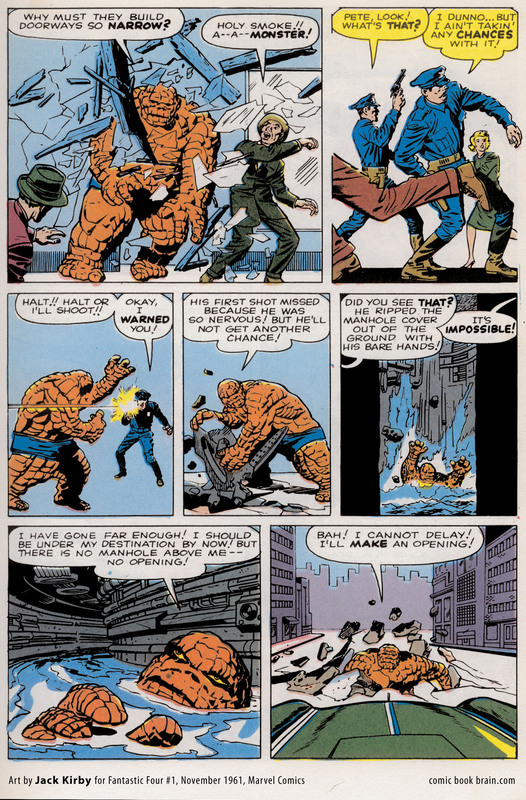 One story from Kirby himself I like is one where he tells how the Thing from the Fantastic Four is him. He uses his language and his manners. The Thing is Jack Kirby. 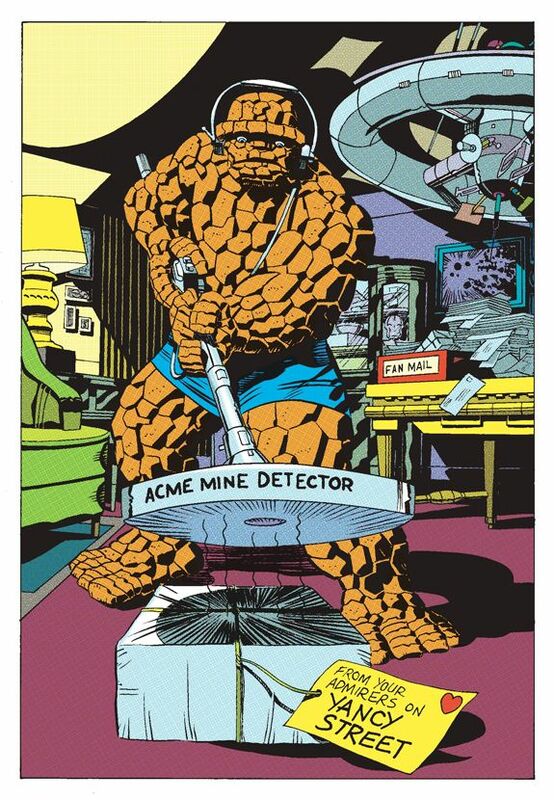 Ben Grimm, The Thing of the FF was Jack Kirby in ways some people didn’t even know. This article here let’s you in on so much of it. I’ve read a lot of it in other places, heard Kirby talk about it in interviews, but get it here in one place. That’s it. One man, every Age, and influencing every age since. I’ll come back and put references in someday. Just can’t do it right now. Five days left in the series. Hope you can last with me, and I can last. The blog may be dying from my regulars not being comic book people, but I’m still enjoying this every minute. Bonus: Get your geek on. One wrap around cover, four classics, one legend.